We recently returned from what is likely our last tenting weekend of the year. Shortly, the weather in Canada will turn quite cold, calling for more robust accommodations than a tent. After all, a tent really is nothing more than an illusion of protection against the elements…a modest shelter of coziness that could be swept away without regard by any large animal or adverse weather conditions. But I think that's why I love camping so much - it attunes you to Mother Nature. Without distraction, the focus is on the natural beauty that surrounds you and procuring the basic necessities to get by.There is nothing quite like falling asleep to the sounds of the outdoors, be it crickets, a crackling fire, rustling leaves or even the rain. In fact, the nights I camp outdoors are the nights I enjoy the soundest sleep. And what a treat it is to be in the company of Mother Nature's littlest creatures...chirping birds, scurrying chipmunks and even bunnies. You certainly can’t get that in the city. So, here's hoping for a quick winter. 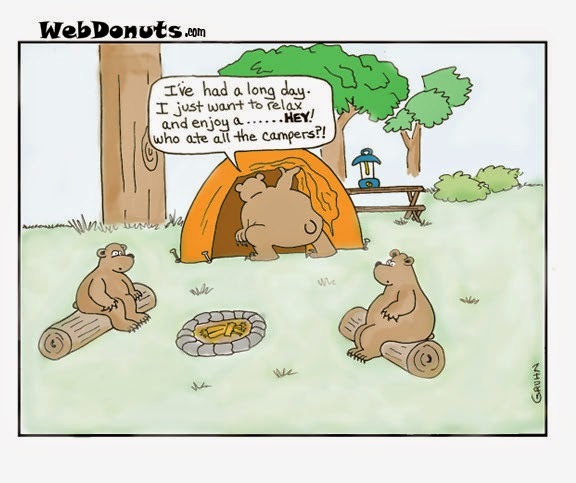 I'll set up my tent when the bears emerge from their clumber once again.